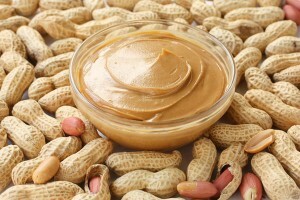 Could exposing infants to peanuts prevent peanut allergies? I love peanut butter, and I am definitely not one of those many health-conscious people who have decided to go gluten-free, so having a food allergy to one of those things would be really difficult for me. When I was a kid, my parents had me tested to see what allergies I may have, and while I tested positive for allergies to 50+ medicines, grasses, trees, particles, and animals, I consider myself very fortunate to not have any foods listed among them. These allergies don’t typically develop at birth, but instead early in life. Allergies are somewhat caused by genetics, however. According to WebMD, Children have 33% chance of having their own allergies if they have one parent with some, and they have 70% chance if both of their parents are allergic to something. People who are genetically prone to allergies typically develop them from frequent close contact to allergens. So it is makes sense that with this in mind, traditionally people have been recommended to keep their young children away from possible food allergens, especially if one or both of their parents has allergies. So when is it prudent to introduce these allergens to children? The American Academy of Pediatrics traditionally recommends to wait one year to introduce children to cow’s milk, two years to introduce them to eggs, and three years to introduce them to peanuts and other nut related products. The reasoning behind this is that children have weaker immune systems when they are infants, so exposure to these possible allergens at that time could lead to an increased risk of being allergic to them. In addition to being exposed to these foods at a young age by eating them, some researchers believe in another possible method of exposure, through the infant’s skin. This method, combined with early oral exposure has become known as dual-allergen-exposure hypothesis. Even with this hypothesis becoming popular in recent years, there are some recent studies that have begun to support early introduction of these allergens, rather than shielding infants from them. One such study surveyed Jewish school children in the UK, and Israel to see if they had peanut allergies. In the UK, 5171 children were surveyed and 5615 were surveyed in Israel. The reason that this is could be significant is that while the UK conforms with the late-introduction guidelines for allergens, Israel does not. In Israel, children are usually introduced to peanuts at a much younger age–typically around 8 months. The study’s null hypothesis is that early exposure of peanuts does not provide an immunity to peanut allergies, while the alternative hypothesis is that it does provide an immunity to the allergens. The study’s results showed that the percentage of UK children surveyed with an allergy to Peanuts was 1.85%. The Israeli school children with peanut allergies was substantially lower, at 0.17%. So according to the conclusion of this study, early exposure to peanut products does in fact build up some kind of immunity to peanut allergies. Of course these results could be due to third variables, such as parent’s disregarding the guidelines, as well as genetic predispositions. Additionally, by limiting the demographic of the study so much (to only Jewish school children), the widespread applicability of this study. Furthermore, the study is observational, as the researchers did not manipulate the early introduction of peanuts to any of these children, as that would probably be unethical. This is an area that could certainly use more research to further explore it. More in-depth questionnaires could be administered, asking parents of subjects when they had decided to introduce their children to peanuts. Surveying a wider range of demographic of people would also help strengthen further studies in this area. This study has, however, changed the way that some people think about the early introduction of peanuts to children. The American Academy of Pediatrics now recommends that parents need not wait the traditional 3 years to introduce their children to Peanut products, but still do not recommend introducing them prior to 6 months of age. So at least for now, there is little reason to fear introducing young children to peanut products. This entry was posted in Uncategorized on October 20, 2016 by Trevor Dennehy. I thought this was a really interesting topic! I never would have thought that introducing kids to allergens when they are younger could help them build a kind of immunity or resistance to it. It does seem risky though – even if the kid doesn’t have the allergy yet, surrounding them with it can still be very frightening, as it’s sometimes hard to tel when reactions will start showing up.I guess the lesson here if you want to try it out is just be safe! This was a well-written blog. This falls under the hygiene hypothesis. Briefly, the hygiene hypothesis states that your body requires a certain level of exposure to certain infectious agents to help build up one’s immune system against those infectious agents. Another instance that the hygiene hypothesis is proposed for is autoimmune diseases. There have been higher instances of them in ‘developed’ countries than in ‘developing’ countries. The hypothesis is because ‘developed’ countries are so clean that people are not exposed early enough to common bacteria that would help build their immune system against such diseases. Some confounding variables about why this might be the case are that ‘developing’ countries just don’t report instances of autoimmune diseases. Overall, this is a very interesting topic and your blog explored it well in relation to allergies. I found this blog relatable because like you I am peanut butter obsessed and so is my mom. You mentioned how exposure to peanuts early on in a child’s life might be beneficial as it would create an immunity to it. My little cousin Evan was exposed to peanuts at an early age (my aunt and uncle are peanut obsessed too). When my aunt took him to get tested for food allergies, they found out he was allergic to all nuts. So I was iffy to agree with your alternative hypothesis. However, as my cousin Evan has gotten older and older, his allergist told him that he can start eating nuts as long as they were not tree nuts. So I wonder if his early exposure to peanuts allowed him to over time be less allergic to nuts. http://www.kidswithfoodallergies.org/page/tree-nut-allergy.aspx <— That is a link to a list of all tree nuts, it might be helpful for anyone with an allergy.